Free CRM is free! NOT! 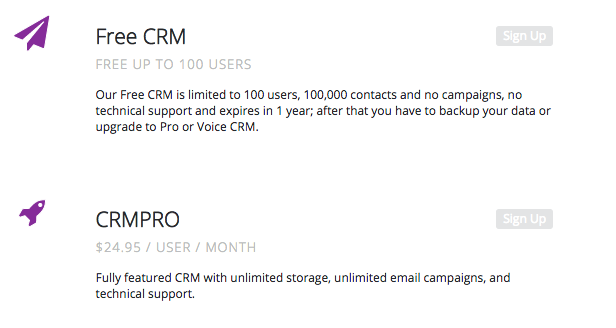 Free CRM is a CRM system that is Free to use… wait. Hang on. No it’s not free. It’s almost $25,000. 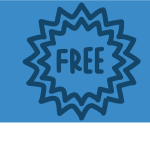 So how can a free CRM get away with calling itself free when it’s not. In this post we look at how Zero BS CRM kicks the pants off the ‘freeCRM’ read on my friend. Read on. Does it annoy you when you see free systems which turn out not to actually be free. Look at the blatantly FREE titled, FREE in the domain, FREE CRM. I’ve taken a screenshot. Does something look odd here? Our Free CRM is limited to 100 users..
OK, so you can have a team of up to 100 users with the Free CRM that’s not bad. A pretty big team by any standards. What else does it restrict? Our Free CRM is limited 100,000 contacts..
Our Free CRM is limited to 100 users, 100,000 contacts and no campaigns, no technical support and expires in 1 year; after that you have to backup your data or upgrade to Pro or Voice CRM. OK, so in the free CRM you’re stuck with no campaigns as well as no support at all. But wait. What’s that.. it expires in 1 year. At which point you need to backup your data or upgrade to their Pro or Voice CRM. What does that really mean? Well it means after spending a year of your time managing your customer data via their platform, you’re forced to pack your bags and leave… or you have to upgrade to one of their premium accounts. That’s certainly quite a bit of bullsh*t right there. It’s the CRM equivalent of spending a year in a loving relationship, making a number of oh so sweet, oh so pretty babies together and then, after a year has passed, she leaves. Takes the kids and asks you for $25 per month, per child… oh and you were pretty busy, you have like, 100 children (congrats man, congrats) so you’re now faced with starting all over or reaching into that wallet and paying $2,400 a month to cover the 100 users and keep your data in your favourite tool. OK, so that was a bit of an exaggeration but that goes to show how the ‘free CRM’ is not free… and the $25 per user, per month. That’s the price of their PRO offering. Jeez… that’s quite pricey… but lets do a quick compare to what free CRM PRO gives you compared to our very own Zero BS CRM. So there’s a ton of additional features in the Free CRM, but out of the box it appears a good solution, until you realise that your free usage ends after a year and you’re forced to pay or get the heck out… but wait..
….I’ll just leave this here shall I? That’s a , not a . 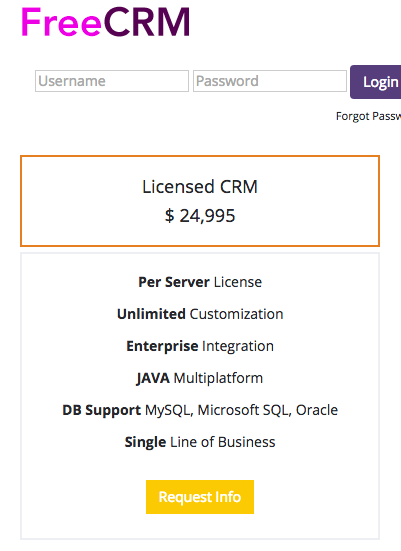 Almost $25,000 for a per server license for a single line of business.